Learn to build relationships with those who can make or break your efforts. Congressional staff are not just your way through a member's door--they are the door. How does your organization get results from these vital behind-the-scenes players? Our Hill experts will share tips and techniques for working successfully with congressional staff. Understand the do's and don'ts you need to know when developing relationships with congressional offices. Learn the differences between personal and committee staff. How to schedule, prepare for and effectively conduct your meetings with staff. Find out which common mistakes will alienate staff and members alike. Which communication methods you must use in this new security-conscious environment. Learn how to write a "one-pager" to leave behind. 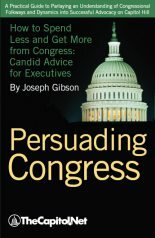 "In Persuading Congress, Joseph Gibson, a longtime veteran of Capitol Hill, offers masterful counsel to anyone who wants to work well with Congress." This session sets the context by defining the political environment in the current Congress, and discussing the congressional members and staff who work there. Specific tools and techniques that you can use to communicate most effectively with members and staff will be described, specifically addressing how you need to adjust your communication at the end of one Congress, and the beginning of another. 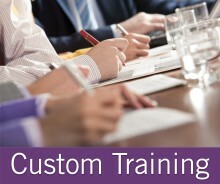 The instructor will provide practical suggestions for making the most of meetings with staff, including how to set-up a meeting, who should attend, and how to follow-up after the meeting. Learn the importance of and how to write a "one pager". The session will provide important "do's" and "don'ts" of interacting with the Hill and building good working relationships between Congress and outside interests. A former member of Congress provides insight into the many pressures and responsibilities that a member must balance in day-to-day decision-making and policy-making. He will then discuss how members rely on staff to deal with the busy Capitol Hill environment, and how outside interests can communicate effectively with staff and members in this environment. Discussion will include how members set up their offices, what they expect from staff, and whether staff influence members. A panel of congressional staff members discuss the positions and responsibilities of committee and personal staff, the organization of congressional offices and the work environment on the Hill. They will focus on what staffers need or expect from outside interests, the most effective forms of communication in the post-anthrax era, and how to build strong working relationships with staffers. The staffers will also provide their insights into the dynamics of Congress. Sample agendas of different versions of this program tailored for previous custom clients are available in Adobe PDF. Audience Level All staff who visit Capitol Hill, answer phone calls from members offices, or deal with congressional correspondence will benefit from this training. Audience Size This program is most effective for between 15 and 35 attendees. Previous Clients Variations of this program have been presented for associations, federal agencies, and unions. Course Materials Course materials can include the Training Edition of Persuading Congress. Usually requires 1/ 2 to 1 day. Internal Marketing To help you publicize and market a custom program to your organization's audience, we can provide printed materials and language for your own internal promotion and publicity. Our faculty for this conference includes registered lobbyists, former members of Congress, current Hill staffers, and other Washington experts.